Oh baby, oh baby, it’s time to get ready for a fun start-of-fall shawl KAL: the Peepaloo shawl featuring Peepaloo Fields Skinny Mini Sock in 2 colors! Oftentimes there aren’t words to express the love between two people. But in my opinion, knitting is a physical representation of love in every stitch. The colorways created by Peepaloo Fields for this shawl design represent 4 real couples, all who love each other, and who have touched our lives in one way or another. Each combination of color is named for the location across the US where each couple now lives: Mesa, Littleton, SoCal and PDX. This KAL will be hosted here, and on Instagram (by me, @notsorryknitter, using #peepalooshawlkal)! The KAL will run from Thursday, September 1st until roughly Thursday, October 13th. This is a fun KAL so there’s no hard and fast deadline. I just like to wrap a shawl project in 6 weeks or so, so I can wear it. And by mid-October, methinks we’re all going to want a shawl! 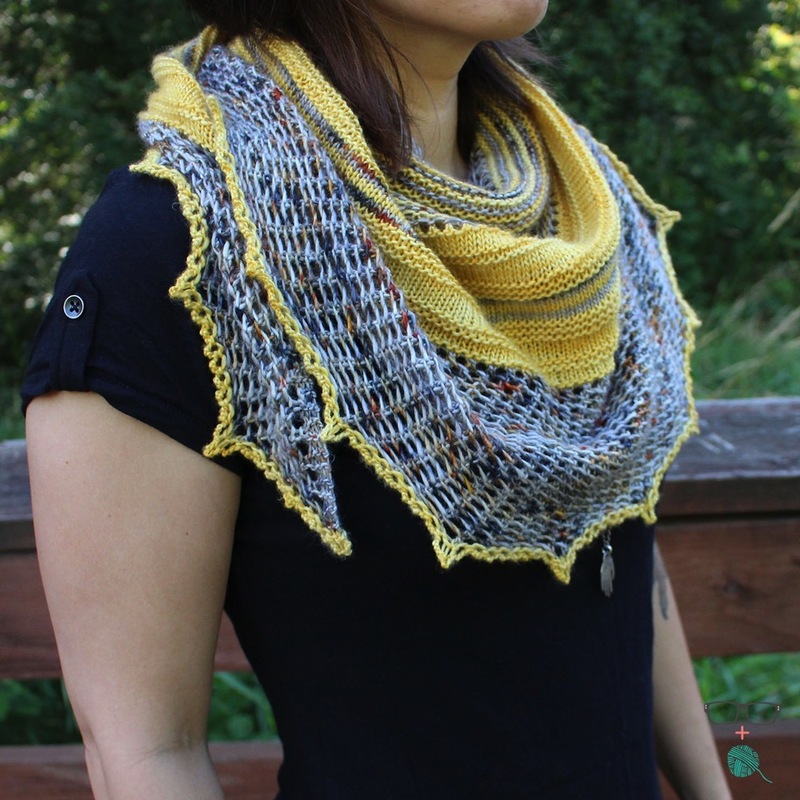 To join in on this awesome KAL, say “hello” in the Peepaloo shawl KAL forum on Ravelry. Then! Download a copy of the pattern, Peepaloo, on sale for $5 (regular: $5.95). Next, jump on over to Peepaloo Fields on Etsy to get your kit yarn. Then come back to the forum and tell me what color combination you've chosen! **Note: all yarns ordered the first week (by August 6th) of the KAL will ship by August 25th as these skeins are dyed to order. Here's a few more details about this shawl that'll help you get prepared to knit along with us! There are a few video tutorials in the shawl pattern to get you on your way and, of course, I'll be there the whole time chatting you all up and cheering on your progress! This shawl is a half-circle shape and worked flat. Written instructions are provided for the entirety of the shawl. To save on yardage it is recommended to carry the colors loosely up the side of the work in the Cast On & Setup and 2-Color Garter sections rather than breaking at each color change. It is recommended to use Color A to swatch for this project as it uses only about 300 yds of a 400 yd skein to complete the project. We hope you'll join us in September! Be sure to get your yarn order in by August 18th to ensure your yarn arrives on time to cast-on! Until then, happy knitting!! !